Want to give your home a definitive look that’s anything but cookie cutter? On this episode of Property Brothers: Buying and Selling, The Scott Brothers help a free-spirited couple remodel their home to make it more appealing to buyers, without losing its unique personality. Kim and Tim have raised their family of 4 in a funky east Nashville neighborhood that’s fitting for their eclectic style. As a unique twist, the home had a second entrance into a bedroom that functioned as Kim’s hair salon. Kim and Tim were ready to upgrade to a larger home and tasked the Property Brothers with prepping their place to sell without losing the funky feel of the neighborhood. Jonathan got to work, and the first order of business was making the formerly dark and crowded living room feel light and bright. Old carpet was swapped out for wide plank flooring in a light stain, and the fireplace got a new marble surround. The windows got a dramatic look with Deluxe Woven Wood Shades in Verona Almond with no liner added. The living room faces a hedged garden, so privacy isn’t needed. The light-as-air woven material lets in lots of natural light. Tailored draperies layered over the shades give the room a cozy feel. Jonathan used glam furniture with edgy metallic accents for an upscale look that still works for East Nashville. 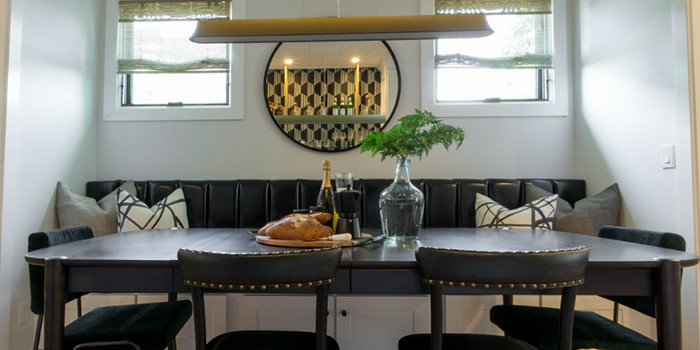 Jonathan maximized space in a cramped dining room by lining one wall with built-in storage and installing a table with banquette seating on the other. The built-in bar is a dramatic focal point with geometric tile and glam brass floating shelves. The windows were re-sized to accommodate the banquette seating and dressed with the same delicate Deluxe Woven Wood Shades in Verona Almond . Black leather seating and a modern hanging brass light give the room an edgy feel. The second entrance was closed off to give the front porch a definitive feel and turn the salon back into a bedroom. The overgrown garden got a major clean up and the porch got cozy new patio furniture. Large windows look out into the private garden, so the modern style inside gets tempered with a natural backdrop. The height of the windows is amplified with luxurious ceiling-height draperies. Fluffy white bedding and glam accessories make the bedroom feel like a hip hotel. To watch the full episode, search Property Brothers: Buying and Selling – Episode 506 Nashville Trade-In, or see more on Facebook. Get the look with Deluxe Woven Wood Shades in Verona Almond from Blinds.com. Previous Article Take the Quiz! How Much Privacy Do Your Windows Really Need?